Explore the tiny villages of ‘old’ Holland from where ships of the 16th century Dutch East India Company set sail in search of silks and spices. Then it’s off to Arnhem scene of the famous battle in 1944 before visiting Antwerp, the city of Diamonds and Rubens with its main square lined by the tall step-gabled, merchant’s houses so typical of the ‘low’ countries. Experience the very best of Flanders in delightfully medieval Ghent. Then onto see Ypres and one of Europe’s finest ‘old world’ cities, delightful Bruges. Listen to the sound of the carillion emanating wonderfully from the instantly recognisable Bell Tower, sip a coffee in the old market square and reflect on how wonderful life can be. Finally discover one of nature’s most spectacular of floral displays, the kaleidoscope of colour that is the Dutch Bulbfields. Upon arrival in Amsterdam, your transfer will take you to the ship where the dedicated crew welcome you aboard ensuring you settle in to your comfortable and extremely well-appointed cabin, and familiarise yourself with the ship, your first-class floating hotel . Guided tour of Amsterdam, one of the world’s most fascinating cities, in a glass-topped canal cruiser; then cruise along the Zuiderzee to visit historic Hoorn. Visit Arnhem, synonymous with the 1944 battle vividly depicted in the film, A Bridge Too Far, and the British HQ at Oosterbeek, now a museum plus the poignant Commonwealth War Cemetery. Sightseeing tour of Antwerp, birthplace of Rubens and a city steeped in history. 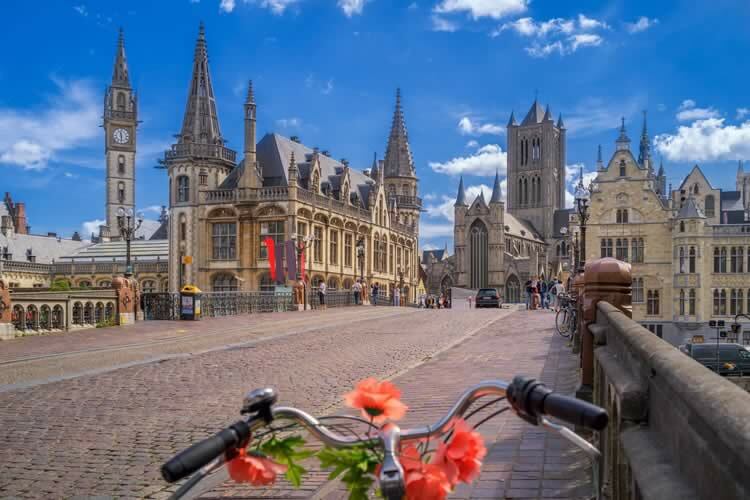 Guided tour of medieval Ghent with its delightful waterfront, followed by a visit to Ypres, home to the Menin Gate, Tyne Cot Cemetery and the infamous battlefield of Passchendaele. Drive to Bruges and enjoy a guided tour of this perfectly preserved medieval town. Visit the magnificent Keukenhof Gardens with their world-famous floral display, returning to the ship in Amsterdam for a free afternoon. After breakfast on board, your transfer will take you to the airport for your flight to the UK.